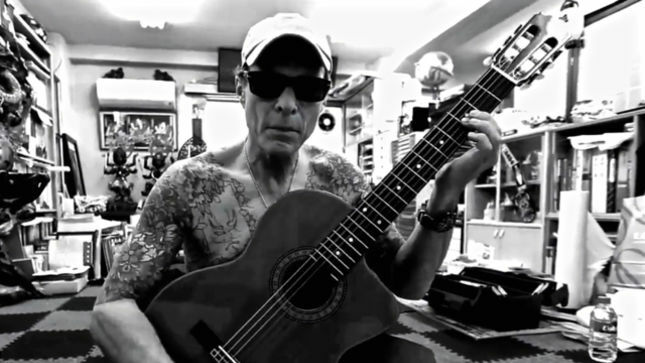 David Lee Roth serenades legendary horishi tattoo artist Horiyoshi III on the latest episode of his online series The Roth Show. The Van Halen frontman picked up his acoustic guitar to provide some music before the Yokohama-based artist - who specializes in Japanese traditional full-body tattoos - created some new ink on the singer’s body…including a dragon on his back and a flower on his arm. In additon to some background music, Roth also delivered a version of John Brim’s “Ice Cream Man” with some new lyrics for the occasion. Roth became a resident of Tokyo in 2012, while maintaining homes in New York City and Pasadena, CA. Last year, Roth and Van Halen released their first live album together, “Tokyo Dome Live In Concert,” and supported the project with a 3-month summer tour of North America. Things have been quiet in the Van Halen camp since they closed out their 2015 tour with a pair of shows at the Hollywood Bowl in early October.